Buying that new axe in Diablo 3 just got a lot more convenient. You won't need a credit card to pick up new gear on Diablo 3's real money auction house; you'll be able to buy things with PayPal instead. Blizzard has teamed up with PayPal to make it the primary payment method for the game's real money transactions. The news that Diablo 3 would have a real money auction house met with a mixed response, with some liking the idea, and others hating it. 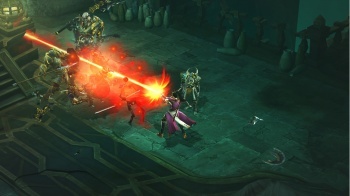 Speaking back in August, Blizzard's Rob Pardo said that the studio was the auction was something that some players clearly wanted, as there had been a real money black market for items for the first two Diablo games. All that Blizzard was doing, he said, was allowing something that was going to happen anyway, but putting it under the studio's control. Blizzard's hope was that by making it a part of the game proper, it could avoid a lot of the problems it had had trying to tackle World of Warcraft's gold sellers. PayPal - which would seem to be the third party payment handler that was hinted at back in August - will make using the Diablo 3 auction house much easier for a lot of people, especially those who don't - or can't - have a credit card. I can see Blizzard making a tidy profit off the back of this, which was probably the point in the first place.